Fri., Sept. 9, 2016, 8:57 p.m. The crowd, about 40 people standing on the asphalt in front of the 4-H building during the Spokane County Interstate Fair, shifts nervously. Santini waits and then starts dancing, pointing his left hand up and down, mimicking a disco dance move. He shakes his hips. The crowd laughs. Santini and his girlfriend, Alexandria Truex, stage name “Du Truex” are two of the three buskers at the fair this year. The two met performing in Portland, and now travel throughout the Northwest performing. Santini’s routine involves juggling, balancing, some body contortion and jokes. Truex is a hula-hooper – she spins her handmade hoops on her arms, legs, nose and at times even her hair bun. In fact, Truex holds the world record for the longest time balancing a hula-hoop on her nose while sitting. The work is physically demanding, and the rewards fickle. 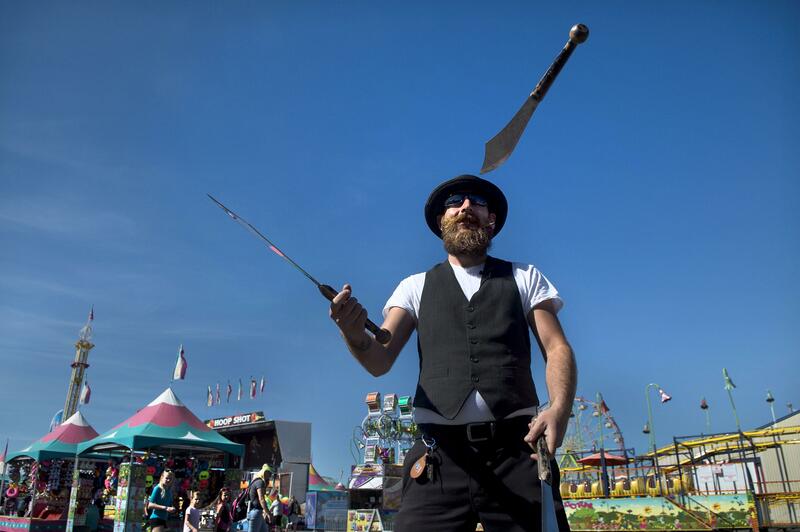 Half the trick is being able to attract a crowd, not an easy task at 4 p.m. on the fair’s opening day. At one point, Truex starts her five-minute routine. She wants to capture the attention of a passing family. If they stick around and watch, others may join. However, about a minute later she stops. The family has moved along. During her five-minute routine Truex said she burns between 500 and 1,000 calories. When Santini finishes his act, he’s drenched in sweat and parched from talking. The two sit together in the shade of a food truck drinking water. But they don’t rest for long. “The pig races are bleeding,” Truex said suddenly. Santini stands and starts to set up his act. In street performance parlance when a large group of people exit another show, restaurant or other event it’s known as bleeding. This is a perfect time to try and capture people’s attention, Truex said. The only other busker at the Spokane fair this year is a good friend of Truex and Santini from Portland. Wells Oviatt performs as a living statue. Covering his body in silver makeup and standing totally still in the sun. At the fair he said he performs for nine hours a day. “It takes a lot of energy to stand that still,” he said. Once, someone pepper-sprayed him in the eye to see if he would move, he said. Another time, a woman thought he was really a statue and kicked him, but he didn’t break character. Street performing isn’t easy, but for Santini it’s a passion. Shortly after he started seven years ago, he packed his bags and moved to New Orleans to learn from the best. At the time he was determined to learn street performing or starve. In New Orleans, older performers mentored him. He’s quick to emphasize the practice it takes to do the job. Published: Sept. 9, 2016, 8:57 p.m.